When Mom came over to visit last weekend, she oohed and awed over the beauty of my cover crops, as usual. But this time around, she had more purpose to her words --- she wanted to know if the radishes were the same as the daikon radishes she's been buying at the grocery store. 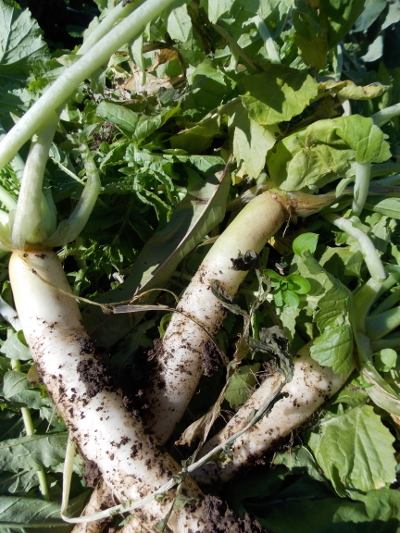 I've posted before that the oilseed radishes grown as cover crops are in the same species as daikon radishes, but probably aren't varieties bred for flavor, so I felt like it couldn't hurt anything to give Mom a few roots to sample. She took them home, sliced them up, and gave me one thumb up. "I like them OK," Mom emailed. "They don't seem quite as spicy as the Daikons, which sell, bigger, at Food City for $3.19, but they are about as spicy as most regular radishes." On the other hand, my sister enjoyed the flavor of the cover crops, so I'm pulling up a few more to toss in the fridge root cellar. I could leave them in the ground, but with lows forecast to reach 10 degrees this week, I don't want to risk them freezing and rotting. "So based upon the OPI Index (October Pattern Index) they are basically saying a cold, wintry start mid-November to early December will give way to mildness that dominates the heart of winter through January 2014 before more average, colder conditions develop in February toward end of the season." 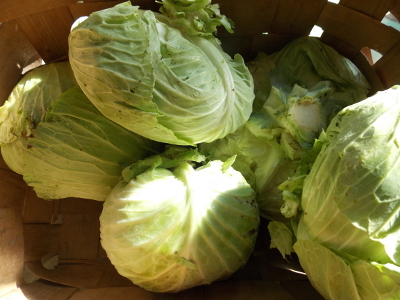 In other words, don't lose heart during this frigid week, but do take your cabbages in and frost protect any last figs out there. I hope you can eat some yourself, or feed them to Mark. I say this so there are more people on my side of the "save the radishes" equation. They are wonderful fresh or cooked. And I imagine their greens are too. I think they are as flavorful as the daikon. But different parts of a root taste differently, and I think the reason Mom did not deem them as equal is because I only let her eat a tiny slice of both radishes. I pigged out on them.. Oink oink! I really am interested to hear about how much money you could earn or save with those expensive radishes you have too! I mean how many 3.95 radishes do you have? I would volunteer lickity split to help you harvest them.